This month's Food 'N Flix pick is The Jane Austen Book Club, a film based on the book of the same name by Karen Joy Fowler. Being a huge Jane Austen nerd (you'll see more evidence of this later in the post), this film is in my large collection of Austen-inspired films and adaptations and I was excited that Kimberly of Coffee and Casseroles selected it this month. (You can check out her announcement post here.) It inspired me to drag out my copy of The Jane Austen Cookbook (did I mention that whole Jane Austen nerd thing?) 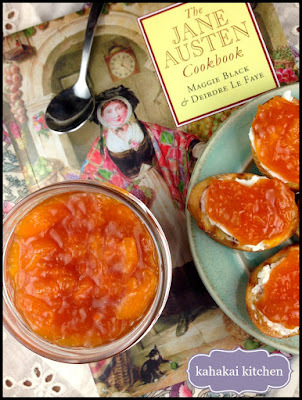 and have a little historical fun in the kitchen this weekend, adapting a couple of Georgian/Regency style recipes into more modern book club bites. 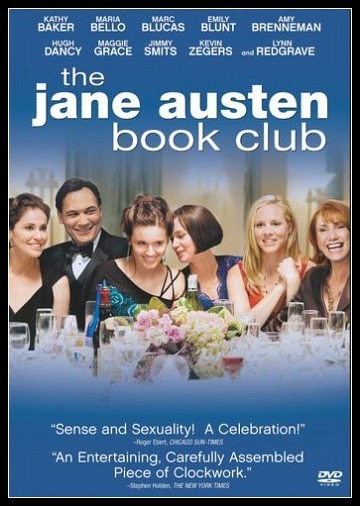 If you haven't seen the film or read the book, the title explains it pretty well... it's about a group of six--five women and one man--who form a book club around the six classic Jane Austen novels, reading a novel each month. The group's own lives and their various issues such as loss, infidelity, dissatisfaction, unrequited love, disappointment, etc. mirror many of Austen's own themes. (As one of the characters, Jocelyn, notes--"Reading Jane Austen is a freaking minefield.") As a person with a tendency to dip into Jane Austen (or Austen-inspired) books or movies when I need an escape from the real world, I can relate to finding solace and comfort there. It's good rom-com-dramady fun, light and sweet. 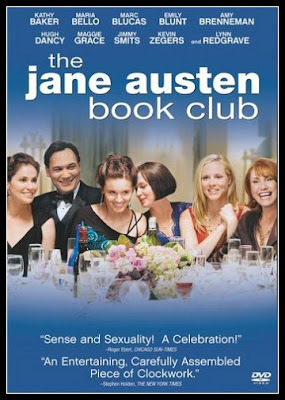 I read The Jane Austen Book Club by Karen Joy Fowler several years ago and although I liked it, I actually like the movie more. I attribute that to a combination of the actors--Amy Brenneman, Jimmy Smits, Kathy Baker, and (an adorable) Hugh Dancy to name my favorites--it's a great ensemble. I also like the way that Robin Swicord, the director (and writer of the screenplay) adapted the book--there are differences in some of the characters and plot points from the book to the film that I think improved the story and there is less emphasis on each character's backstory--which in my opinion made the book a little 'draggy" at times. It is fun to match the various movie/book characters to Jane Austen's originals and Swicord gives some great commentary about the various match-ups of the book's characters to Austen's on one of the "extras" included on the DVD. It had been a while since I had seen the movie and I had never watched it looking for food inspiration, so it was a fun challenge to decide what to make. For the most part, the food is shown in quick glimpses in the background--coffee and pastry at Starbucks, a few restaurant meals, a dozen eggs for a flan... Most of the book club fare is shown quickly--dips and finger foods and plenty of wine and cocktails. I ended up finding my inspiration in a conversation the characters had about setting up the book club at the local Starbucks where the group picks their books to host. Sylvia (Amy Brenneman) says, "Let's not get into the competitive cooking thing" while Bernadette (Kathy Baker) chants "Bake-off!" Jocelyn (Maria Bello) chimes in with "No, we'll do finger foods" and Sylvia says, "We can do takeout." 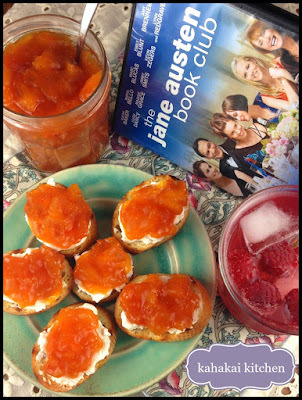 It was Jocelyn's final food/hosting comment that got me thinking the most... "We have to create the Jane Austen mood." 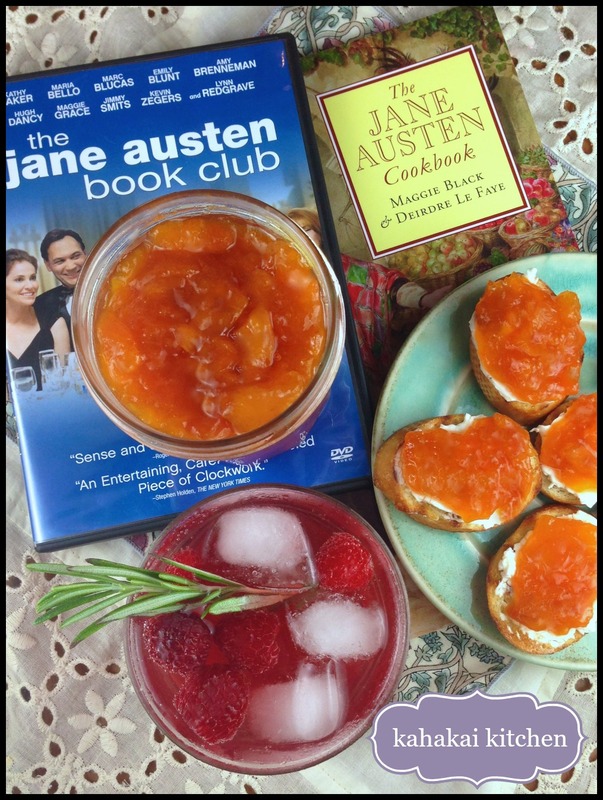 If I were in an actual Jane Austen book club, you can bet that I would be trying to create the Jane Austen mood, and what better way than taking inspiration from The Jane Austen Cookbook by Maggie Black and Deidre Le Faye? I bought this cookbook at a used book store a few years ago with the intention of someday making White Soup to accompany one of my re-reads of Pride and Prejudice. 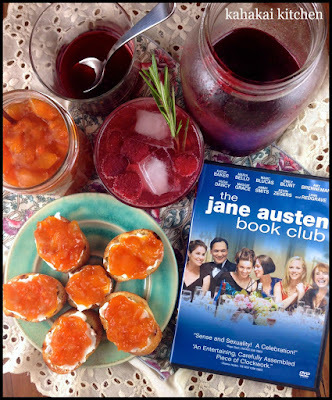 (Yep--Jane Austen nerdiness...) That plan never quite happened and the cookbook has sat on my shelves, but I knew there had to be a recipe or two in there that would be appropriate for book club noshing. I didn't really feel like baking and wanted something in the finger food category that was relatively simple. Marmalett of Aprecoks (aka Apricot Marmalade) quickly caught my eye. At the beginning of the movie, Sylvia and her husband are eating at the Marmalade Cafe--which I thought was an adorable name for a restaurant. Of course it is where he tells her he has been unfaithful and wants out of the marriage to be with the other woman so I feel a bit bad in having that as a small part of my inspiration--but oh well! ;-) A couple of pages later, I found a Raspberry 'Vinegar' (Cordial) which was a happy coincidence since I have been wanting to make a fruit 'drinking shrub' ever since enjoying an apple shrub in a cocktail a few months ago. (A shrub is a drinking vinegar, usually infused with fruit or herbs and used in sodas or mixed drinks.) 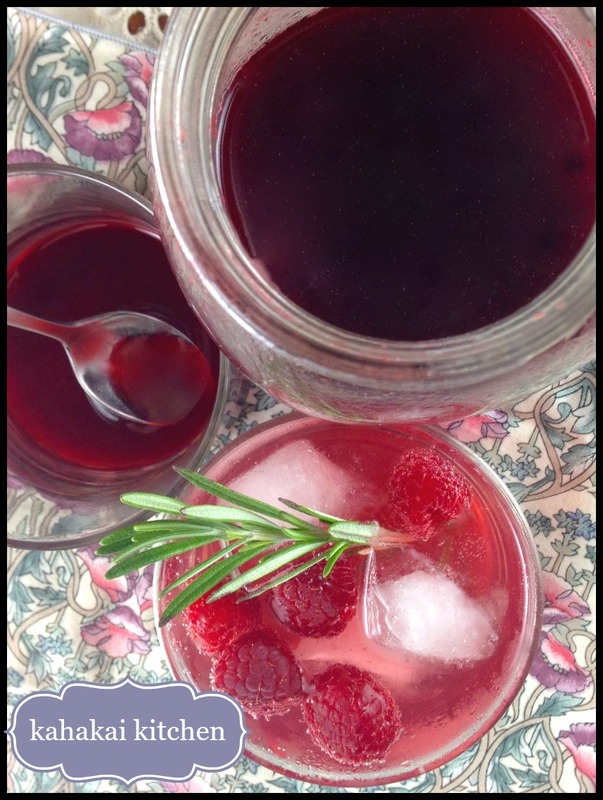 The cordial recipe seemed close to a shrub, although I updated the preparation slightly due to time and served mine with soda instead of stirring it into cold water as the book prescribes. Both recipes--Apricot Marmalade on Baguette & Raspberry Drinking Shrub Sodas--were easy enough, fun to make, and really delicious. Below are the recipes from the book, my updates/changes are noted in red. The Apricot Marmalade is made with 'pipin' water--or apple water made from the peelings and cores of apples (natural pectin) which I thought sounded fun. To update the marmalade and turn it into an appetizer, I served it on grilled baguette with a schmeer of labneh (strained yogurt cheese) to offset the sweet. 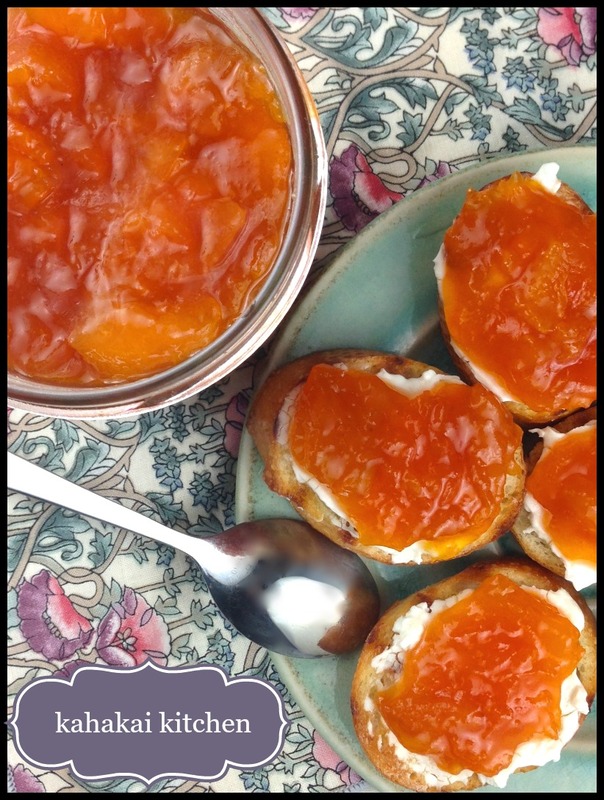 The Jane Austen Cookbook notes that "when made before 1740, marmalett might be either a fruit paste or a whole-fruit jellied conserve made with apple-water and sometimes called a jelly. Preserves like these, including jams. stayed largely unchanged until the nineteenth century." Drain the apricots and put them in a large sauce pan or a preserving pan with the sugar. Add the apple water and bring slowly to the boil, skimming occasionally. Cook steadily until the syrup sheets a spoon and drips from it slowly in blobs, then skim again and test for setting quality by dropping a few drips on a cold plate. They should 'jelly' on contact with the plate. 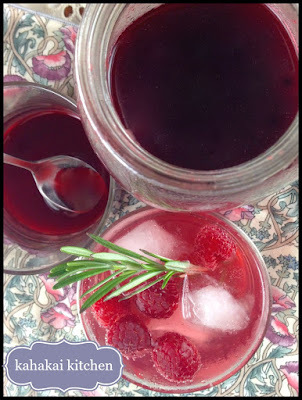 About the raspberry cordial, The Jane Austen Cookbook notes: "This used to be a great treat for country children, but is more often used now as a drink for wise drivers. (Orgeat was a similar cooling drink made from barley or almonds and orange-flower water.)" Put the raspberries and vinegar in a bowl and leave. covered for 5-6 days, stirring occasionally. Mash well and strain through a jelly bag without extracting any pressure. Measure the liquid and allow 1 lb /450g sugar to each pint of liquid. Bring to a boil slowly, stirring well to dissolve the sugar. Simmer for 20 minutes. Skim and leave until cold. The deadline for December's Food 'N Flix is today and Coffee & Casseroles will be rounding up the entries on her blog soon. If you missed out on this month's fun and like food, movies and foodie movies, consider joining us for January's pick: Failure to Launch, hosted by Amy's Cooking Adventures. We finally started getting Jacques Pépin's cooking show Heart & Soul here on PBS a few weeks ago and I have been DVRing them (and of course I had to buy the companion cookbook Heart & Soul in the Kitchen on sale, with a coupon). 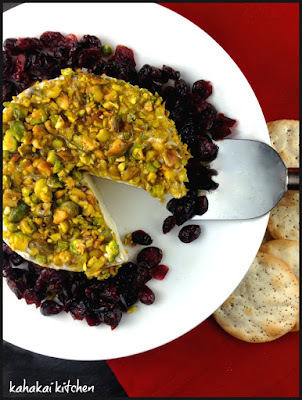 On the first episode I got around to watching, Chef Pépin made simple and pretty Camembert with Pistachio Crust. I love an appetizer that tastes delicious and looks fancy--but is really low-effort to make and this one fits the bill with just four ingredients, plus whatever you serve it with. My local grocery stores didn't happen to have Camembert rounds but the brie rounds were on sale and I think it makes an excellent substitute. Process the nuts in a food processor until pulverized but not ground into a powder—small pieces of nuts should still be visible. Unwrap the cheese. If you object to the crust, you can scrape it lightly; I leave it on. Brush the top and sides of the cheese with the honey. Sprinkle a layer of nuts on top of the Camembert and, holding the cheese round in one hand, pat more nuts around the sides with the other hand, pressing lightly on the nuts so they stick. Put the remaining nuts in the center of a serving platter and place the cheese on top. Sprinkle the cranberries around the cheese and serve at room temperature, with crackers. 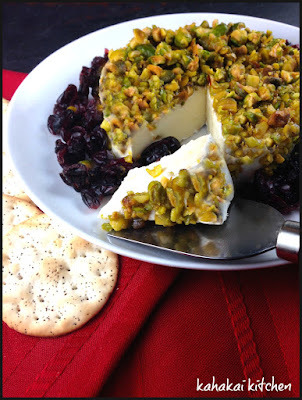 Notes/Results: The combination of the creamy cheese, with the toasted nuts, tangy cranberries and sweet honey is delicious. This is a quick and easy dish to put together although I had a challenge getting the ground nuts to stick well to the sides of the cheese wheel--not sure if my honey was too runny to coat thickly but I did try Pépin's "hold the honey-brushed brie on one hand and turn it while patting the nuts on" method. Oh well, I think it still looked pretty. I served it with cracked pepper table water crackers--I like the little bite they give. This makes a great replacement or addition to a cheese plate and you could use any combination of dried fruit and nuts. I will make it again. 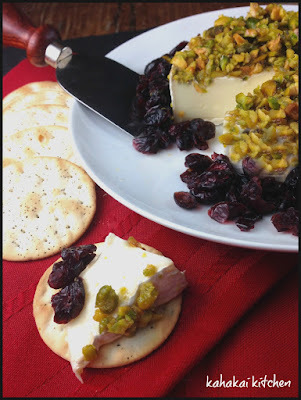 This simple appetizer is linking up at I Heart Cooking Clubs. 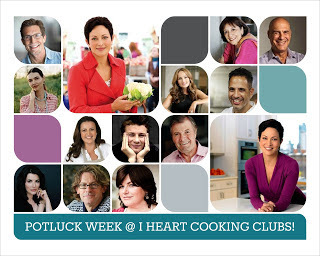 It's Potluck week, the chance to make any recipe from the current or past IHCC featured chefs. You can see what chefs and recipes everyone chose to cook from by checking out the picture links on the post. 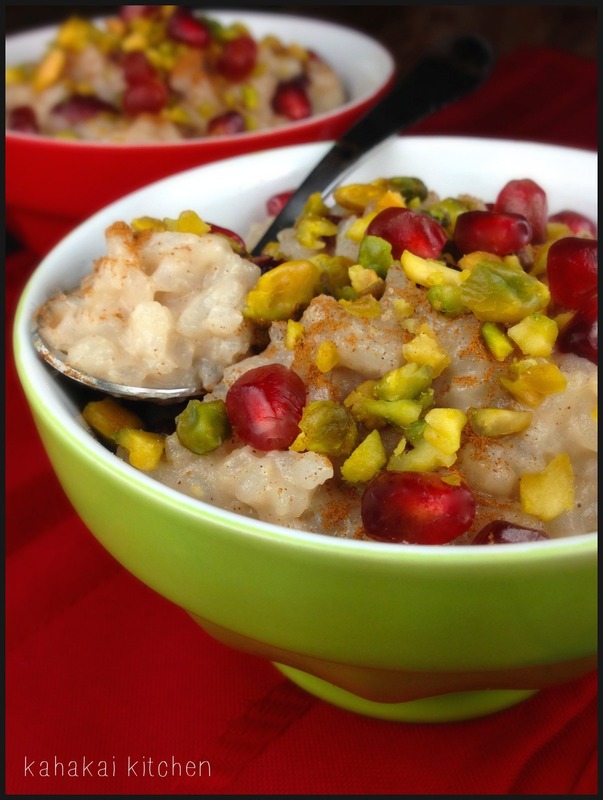 Rice pudding is the 'ultimate comfort food' according to Ruth Reichl and I have to agree. it makes a great breakfast, snack, or dessert when you need something that warms and fills your soul as much as it warms and fills your belly. This non-dairy Very Vanilla Rice Pudding by Ellie Krieger, is the eighth rice pudding I have posted on the blog (including four from former I Heart Cooking Clubs featured chefs Jamie Oliver, Rick Bayless, Madhur Jaffrey, and Diane Henry). Since this week's IHCC theme is Cinnamon & Sugar, it seemed like the perfect time to try Ellie's version. 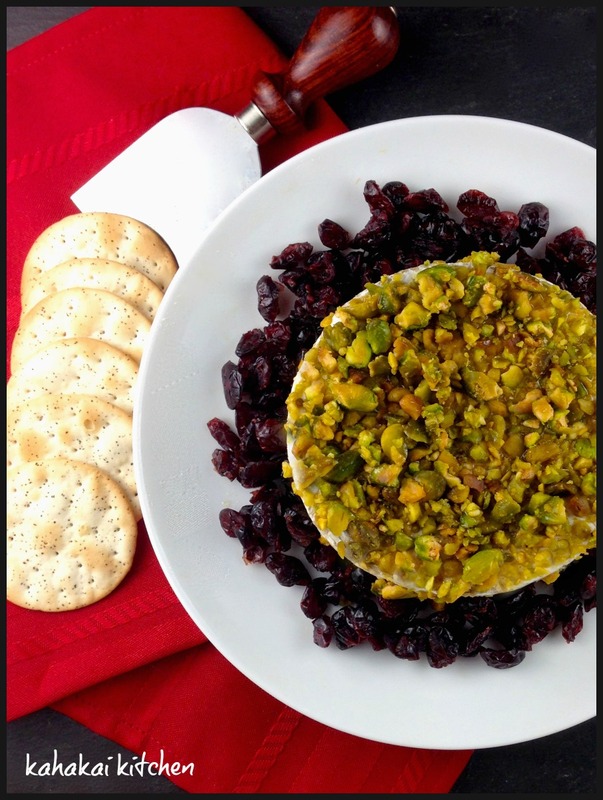 I made a few changes to the recipe (noted in red below) and I added some holiday dazzle by adding dried cranberries to the pudding itself and then topping it with pomegranate seeds and pistachios. Ellie says, "This pudding is intoxicatingly fragrant and flavorful, offering a big dose of comforting deliciousness. 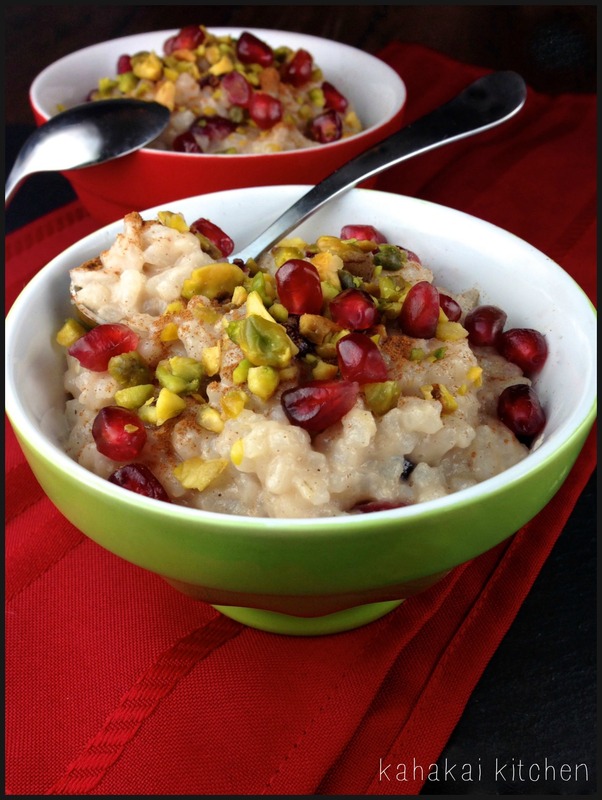 Aborio rice, the same kind used in risotto, lends a thick creaminess to this pudding without the addition of any cream, while the vanilla soy milk imparts a richer flavor and texture than regular milk." Bring the water to boil in a medium, heavy, ovenproof saucepan. Add the rice, cover, reduce the heat to low, and simmer until the rice is nearly cooked, about 20 minutes. Remove from the oven, uncover, and remove the cinnamon stick. Stir in the vanilla, ground cinnamon and nutmeg. The pudding will be slightly liquidy; the liquid will continue to absorb into the rice and thicken as the pudding cools. Distribute among bowls, dusting with more cinnamon and nutmeg (and other garnishments of choice). Serve warm of at room temperature. The pudding will keep in the fridge in an airtight container for about 3 days. Notes/Results: Just a gorgeously creamy bowl of rice pudding goodness. 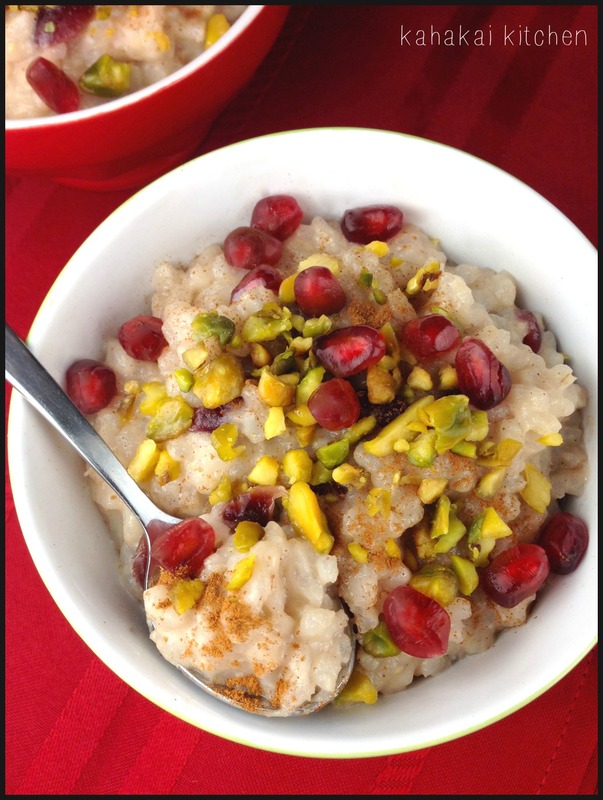 Although I've used brown rice, basmati rice, and regular medium-grain rice before, I had never made rice pudding with aborio rice and the creaminess it adds to the dish is pretty wonderful. I had unsweetened vanilla coconut milk on hand so I used it instead of soy milk and found it slightly richer, adding to the decadent feel of this pudding. Being not a great fan of nutmeg, I just doubled the ground cinnamon--with it and the extra vanilla extract I added, both flavors really came through. I tend to prefer stove top rice puddings and since I was making a small batch this round, I didn't try Ellie's oven method--maybe next time I will give it a whirl. 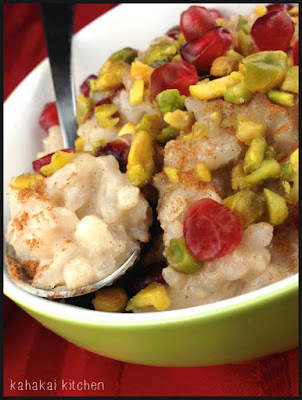 To me, dried fruit and toppings are a must in rice pudding for the pops of flavor and texture they add--like little treasures, turning something humble and slightly plain into a festive treat. I would happily make this again. 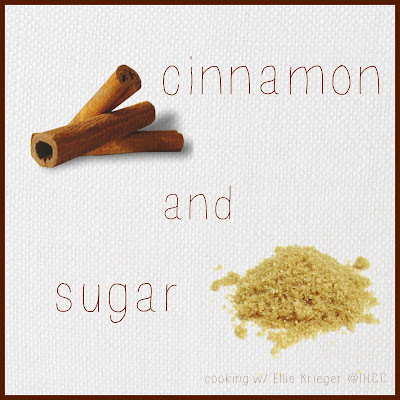 This post is linked to I Heart Cooking Clubs for this week's Cinnamon & Sugar theme. You can see what Ellie Krieger dishes everyone made by checking out the picture links on the post. Much as I vow to stop going by the book table at Costco, I cheated on my last visit and took a look. I have been seeing recipes from Giada De Laurentiis' latest cookbook Happy Cooking: Make Every Meal Count ... Without Stressing Out in various places and so I succumbed and bought myself an early Christmas present. Since we are featuring Giada this week at I Heart Cooking Clubs as part of our Monthly Featured Chef theme, the timing was perfect. There were plenty of recipes that I tagged to make, including four risottos; Spiced Kabocha Squash Risotto, Chorizo Risotto, Dairy-Free Risotto with Mushrooms and Peas and Artichoke Risotto. 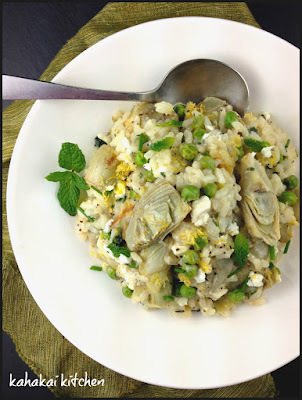 I happened to be craving the comfort of risotto and since I had artichoke hearts and peas in the freezer and feta that needed to be used up in the fridge, this Artichoke Risotto solved the 'what to make first from the new cookbook' dilemma. 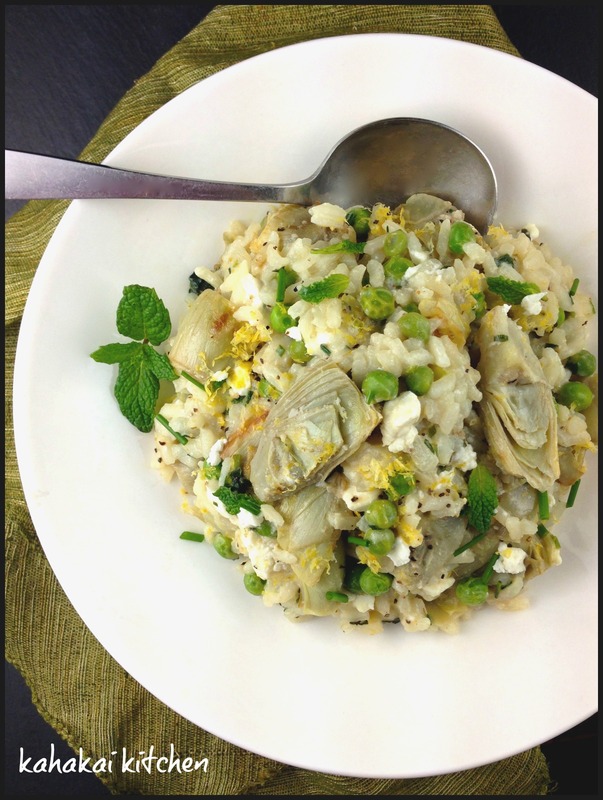 You may be thinking that this seems more like a spring recipe than a December one, and you would be right, the other three risottos have a more winter-ish feel, but the heart wants what the heart wants and mine wanted artichokes and feta. We also get locally grown mint and chives year-round here so it works. Giada says, "Using frozen artichoke hearts makes this quick and easy enough for a weeknight; fresh mint, chives and peas make it memorable." Heat 2 tablespoons of the olive oil in a medium saucepan over high heat. Add the artichoke hearts and reduce the heat to medium high. Cook, stirring occasionally, for about 10 minutes, or until the hearts are beginning to brown. Remove to a plate and set aside. To the same pan, add the remaining 2 tablespoons olive oil, the butter and the shallots and cook for 1 minute, stirring regularly. Add the rice and salt and stir with a wooden spoon to coat all the kernels with oil. Continue to cook for 3 minutes, or until the rice is sizzling. Add the wine and cook, stirring, until it is almost completely absorbed. Now begin adding the chicken broth, one cup at a time, stirring frequently between additions. After the first cup is almost entirely absorbed, add the next cup. Continue in this way until the rice is cooked through and you have a creamy risotto, about 20 minutes in all. (The risotto should be slightly loose, not dry; it should run off your spoon. If it gets too dry, add a bit more broth.) 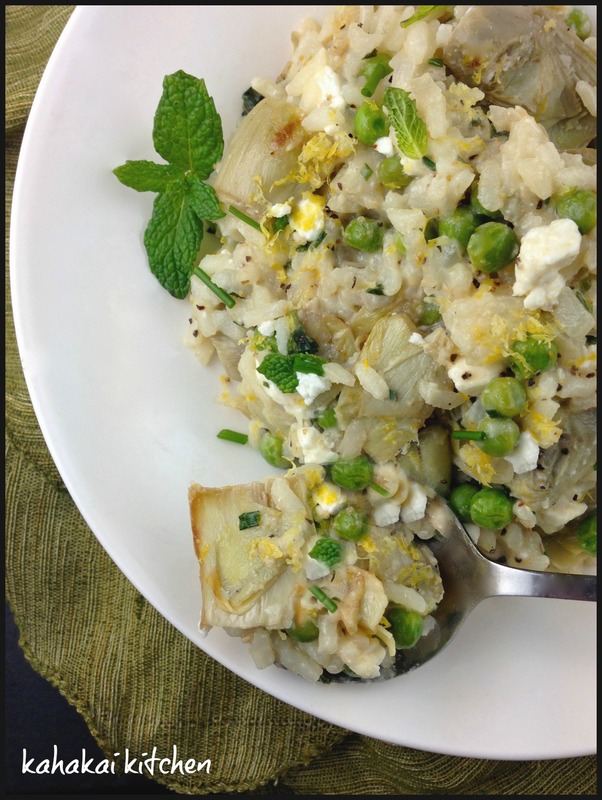 Stir in the peas, feta, chives, mint and black pepper. Gently stir in the artichoke hearts and the lemon juice. Serve. 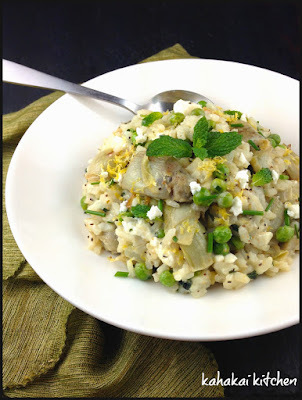 Notes/Results: This was a delicious risotto with a great contrast of flavor--the sweetness of the onion and peas, the salty bits of feta and the bright and tangy flavor of the artichoke hearts and the lemon. 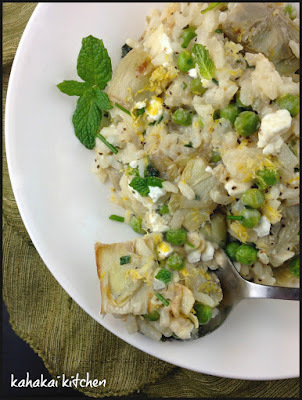 The feta melts a bit into the rice, adding creaminess but still has some good little chunks. Just really yummy and good--rich but lively enough that it doesn't feel heavy. I did end up using about 4 cups of broth--3 1/2 cups would not quite have been enough and my risotto cooked in about 25 minutes. Giada says 4 to 6 servings but I think it is closer to 4 unless you are serving really tiny servings as a starter. 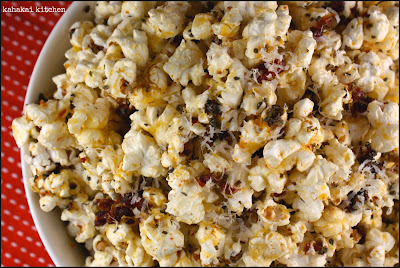 Easy, with some of my favorite ingredients and flavors, I will definitely make this one again. You can see what Giada dishes my pals at IHCC made this week by following the picture links on the post (here). 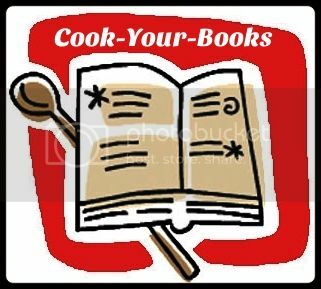 I am also linking this post up with the Cook-Your-Books event (#29!) with Joyce at Kitchen Flavours. Do you have a favorite Giada recipe? Ellie says, "This fresh green, creamy dip, excerpted from the cookbook The Food You Crave, has all the classic hummus flavors of garlic, cumin, and lemon. But it is light on the cumin and garlic in favor of a big citrus punch." Set 1 Tbsp of the edamame aside for a garnish. 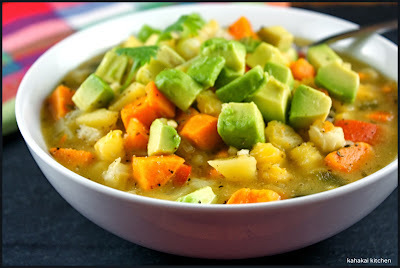 Place the rest, along with the tofu, salt, pepper, cumin, garlic, oil and lemon juice, in a food processor and process until very smooth, about 2 minutes. Taste and adjust the seasoning with more salt, pepper, or lemon juice, if desired. 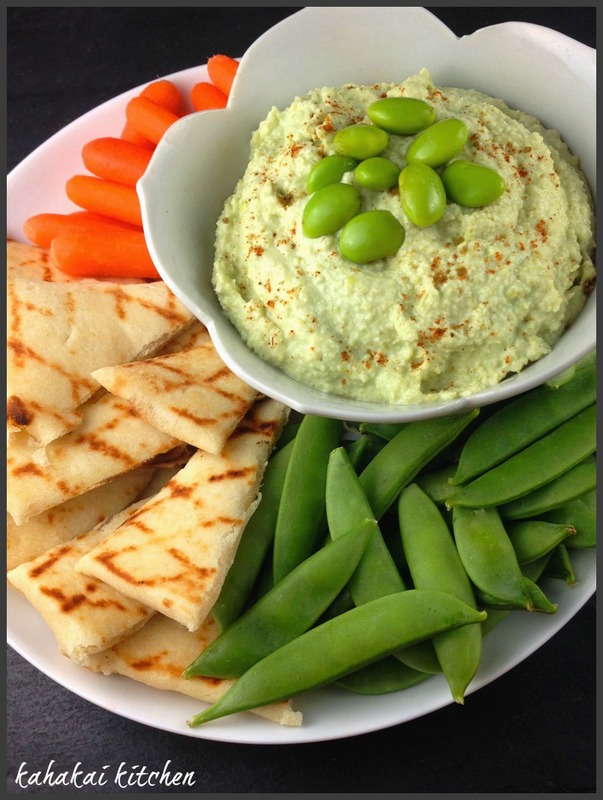 Transfer the hummus to a serving bowl and garnish with the reserved edamame and a sprinkle of cumin. 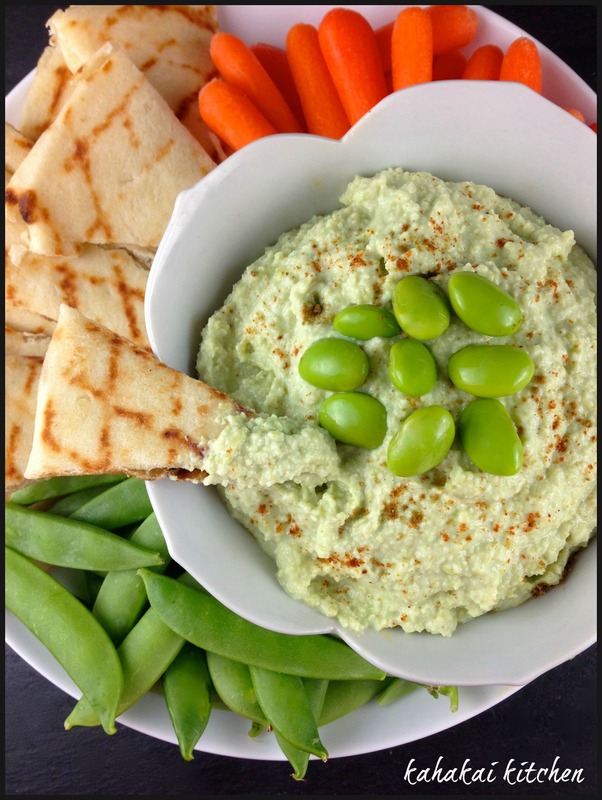 Serve with spiced pita chips, bread or veggies as desired. 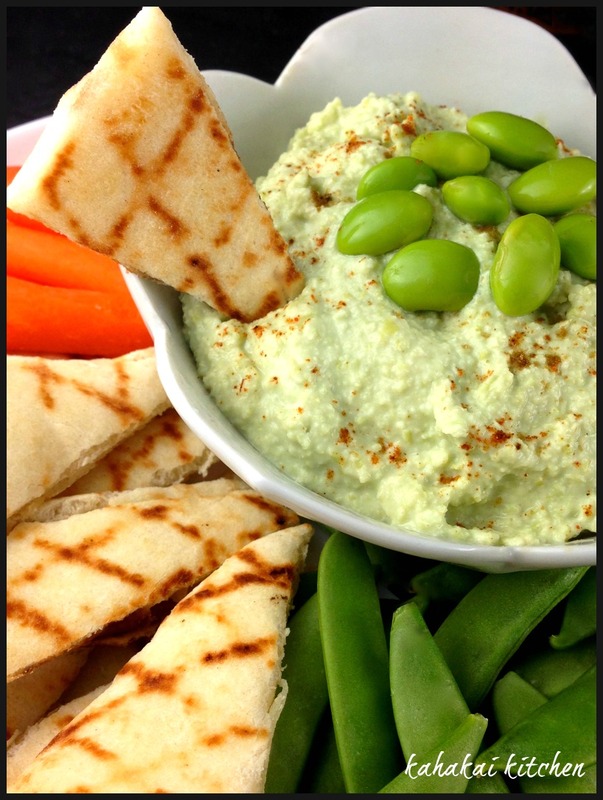 Hummus can be stored in an airtight container in the refrigerator for up to 3 days. Notes/Results: Creamy, fresh and lemony, this hummus reminds me a lot of my favorite edamame-feta dip--with no dairy and less fat and calories. Ellie has a recipe for spiced pita chips to accompany the dip but since I had a piece of naan bread in the freezer and veggies (baby carrots and sugar snap peas) in the crisper, I used those instead--toasting the naan in an dry grill pan and slicing it into triangles with a pizza wheel. 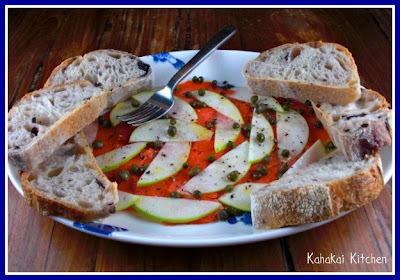 (Adding red pepper strips and radishes would make a nice red and green presentation for the holidays too.) Fast, easy, and good, I will definitely be making it again. It's Nibbles & Noshes week at I Heart Cooking Clubs. 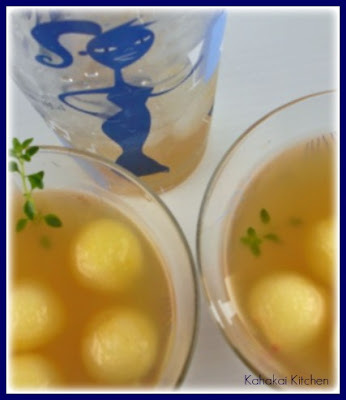 You can see what Ellie Krieger appetizers everyone made by checking out the picture links on the post. It's my last TLC Book Tour of the year (and can you believe that this final review makes it 50 book tour reviews for the year!?) and it's a slightly different genre for me--historical science-fiction. Today I am reviewing the novella, Without Light or Guide: Los Nefilim Part Two by T. Frohock (with a glimpse of Part 1 Midnight's Silence included). Set in Spain, primarily in the 1930s, this series creates a unique otherworld of angels and demons. 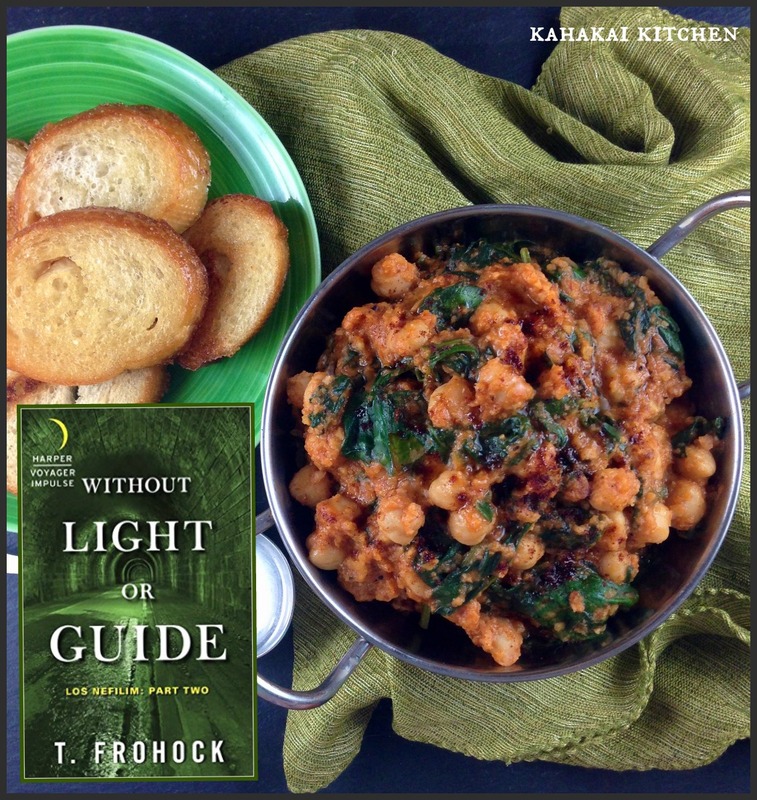 Accompanying my book review is a recipe for Espinacas con Garbanzos (Spanish Chickpeas & Spinach), a tapas or small plate dish, inspired by my reading. Always holding themselves aloft from the affairs of mortals, Los Nefilim have thrived for eons. But with the Spanish Civil War looming, their fragile independence is shaken by the machinations of angels and daimons… and a half breed caught in between. Although Diago Alvarez has pledged his loyalty to Los Nefilim, there are many who don’t trust his daimonic blood. And with the re-emergence of his father—a Nefil who sold his soul to a daimon—the fear is Diago will soon follow the same path. Yet even as Diago tries to prove his allegiance, events conspire that only fuel the other Nefilim’s suspicions—including the fact that every mortal Diago has known in Barcelona is being brutally murdered. 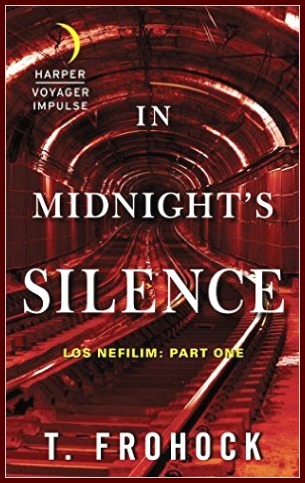 No matter how well each book stands on its own, I have a *thing* about reading a series in order, so when the chance to read this second book in the Los Nefilim series, I asked for a copy of the first book, In Midnight's Silence. So you know that as usual, I am going to recommend that you start with In Midnight's Silence too--both e-books are only .99 cents right now on Amazon, they are quick read novellas, and both are interesting and enjoyable stories--so well worth it. 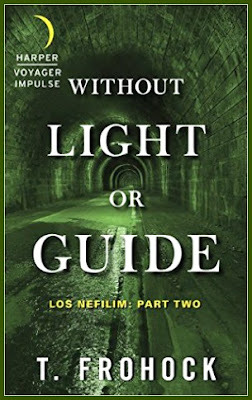 But, just in case you don't take my advice, the author provides a brief recap or refresher of the events and people in the first book which is super helpful since the world of the Los Nefilim world is complicated. I think if you are going to have a series of novellas with lots of characters and world-building, recaps like this are a brilliant idea. Thumbs up to the author for such a smart idea! Book One, Midnight's Silence, sets up the world of Los Nefilim, a group of angel-born reincarnates that monitor demon activity for the angels. Diago Alvarez, was born of an angel mother and a former Nefil with demonic parents, and is caught between the two groups, remaining neutral in their conflict. It is 1931 in Spain and Diago has a lover, Miquel, who is an officer in Los Nefilim. The two live together in Barcelona, after Miquel,was reassigned there from Seville by Los Nefilim's leader Guillermo. Diago returns home one evening from his job teaching music and finds Miquel has been taken by an angel (Prieto) and Diago is forced to offer a child to the daimon Moloch in exchange for a coin Prieto wants that holds the key to a powerful bomb. Diago must use his wits and the power of his song to save Miquel and the child, who he has a very personal connection to. Without Light or Guide picks up shortly after Midnight's Silence leaves off. Diago and Miquel are back in Seville with (spoiler if you haven't read the first book) his newly-found son Rafael, recovering from the grave wounds he received from his battle with Moloch. Diago has chosen to pledge his allegiance to Guillermo and Los Nefilim, in part so that Rafael will be protected but finds him self doubted by many--who think he will choose the daimon side like his father. 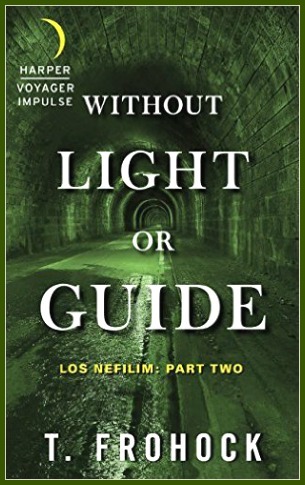 Guillermo has a dangerous assignment for Diago as the battle between the angels and daimons escalates, putting the mortal world and Los Nefilim even more at risk. Whew! It is hard to explain these books and have it make sense and do justice to the dark and detailed world that T. Frohock has created--the historical aspects of the 1930's Spain setting, the fantasy realm of angels, daimons, Los Nefilim, and the songs that give them their power. You also have love--familial with Rafael and the enduring romantic love between Diago and Miquel, loyalty and betrayal, and the crisscrossing lines of good and evil. Although different from most of my usual reading, I found myself caring about the characters, wrapped up in the story, and looking forward to seeing what comes in the next installment. Author Notes: T. Frohock has turned her love of dark fantasy and horror into tales of deliciously creepy fiction. She currently lives in North Carolina where she has long been accused of telling stories, which is a southern colloquialism for lying. Check out more of her works and news at www.tfrohock.com. The Los Nefilim series gets a lot of story telling done but understandably doesn't spend a lot of time on food. There is some mention of pastries, coffee and tea, bread and of course the mentions of Seville made me think of oranges. In Without Light or Guide there is a mention of a pleasant family dinner cooked Miquel including roasted vegetables, bread and butter, and homemade wine. At one point, Diago, new to his role as a father, reaches over and daubs a piece of spinach from Rafael's lips so I decided to take my inspiration from both the spinach and from Spain. 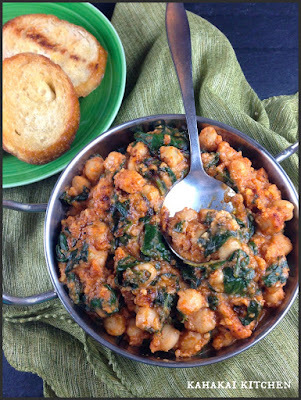 When I put the two together and looked on line, several recipes for Espinacas con Garbanzos or Spanish Chickpeas & Spinach came up. 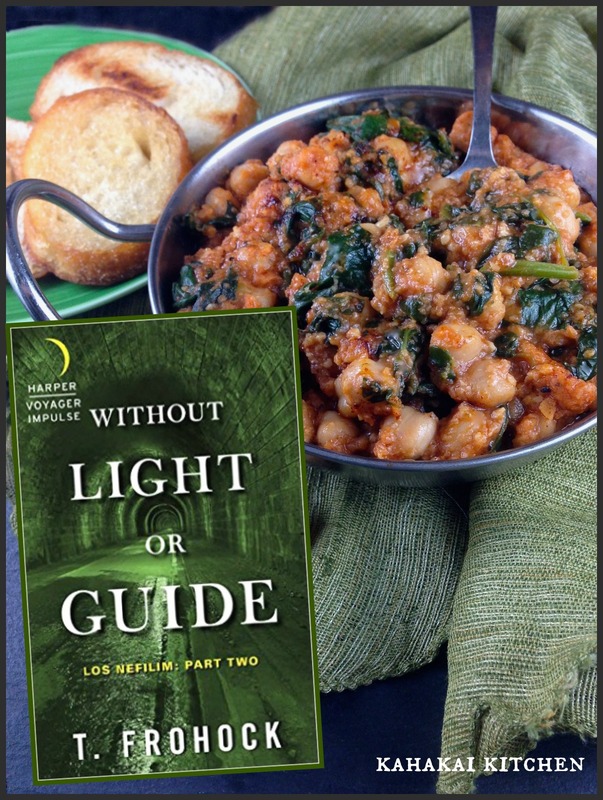 Since it seems to be a traditional tapas (small plate) dish in Seville--especially during the cooler months, I thought it a perfect dish to represent the book. 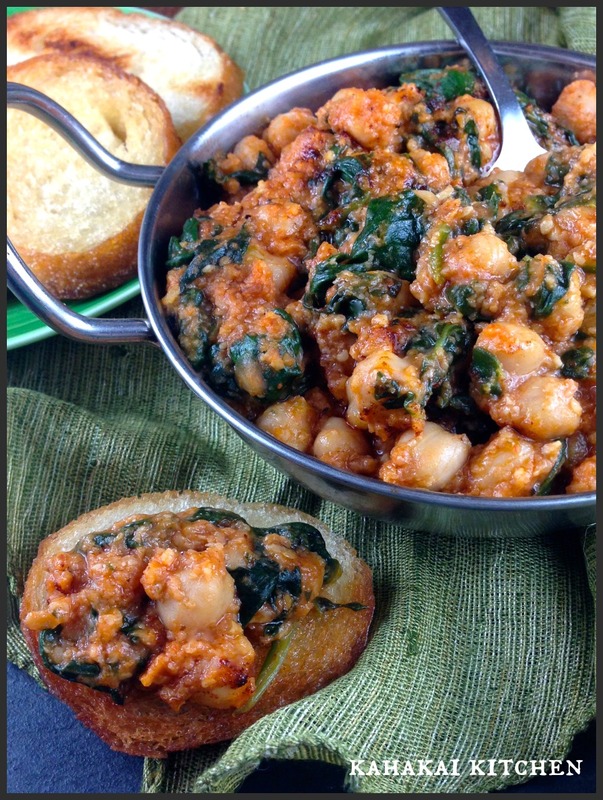 I love that it is such a simple dish that uses pantry and fridge items I usually have stocked up--chickpeas, stale bread, a big container or baby spinach, Marcona almonds (my favorite), and sherry vinegar. For some reason I decided I was nearly out of sherry vinegar (I had over half a bottle--grrr...) and *needed* a second bottle. Cooking along with British chef Nigel Slater got me into drizzling a bit of sherry vinegar on my eggs but I am always looking for different ways to use it up. There were many different interpretations of the dish online but I liked this stew-like version found at Spanish Sabores. Recipe Author Lauren Aloise Notes: Espinacas con garbanzos are a traditional tapa in Seville, especially popular during the chilly winter months and during lent. But the dish’s history goes far beyond Andalusia. Spinach comes from Ancient Persia (modern Iran), where Arab traders got their hands on it and eventually introduced it to the Mediterranean. There are records of spinach being a popular Spanish vegetable by the end of the 12th century, and it was an important ingredient in Moorish and Sephardic Jewish cuisine in Spain." Coat a large saucepan with extra virgin olive oil and heat to medium-high. Before the oil gets too hot, add the spinach (in batches if necessary) and sauté until just wilted. Remove spinach and strain in a colander. Re-coat the pan with olive oil and add in the bread cubes and raw almonds. Fry until the bread and almonds are browned and crispy on each side. Add the chopped garlic, cumin, cayenne and black pepper and sauté for a couple of minutes, until the garlic is fragrant and turning brown. Transfer the saucepan ingredients to a blender/food processor and add the sherry vinegar. Blend the ingredients together by pulsing until you have a thick paste (don't over blend and make it gooey). Return the paste to the saucepan and add your garbanzo beans and tomato sauce. Stir gently until the chickpeas are fully coated by the sauce (add a bit of water to thin things out if needed). Add the spinach and stir gently until it is evenly incorporated and everything is heated through. To Plate, Place chickpea-spinach mixture in a bowl and drizzle a swirl of extra virgin olive oil on top, then sprinkle on a small amount of smoked Spanish paprika. Serve with grilled bread if desired. 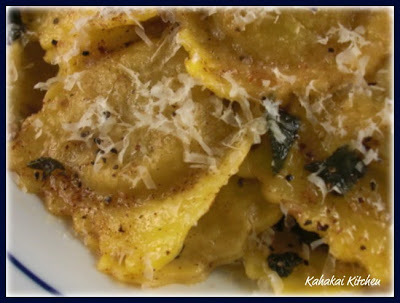 Notes/Results: Such an easy dish with wonderful flavor. The sherry vinegar really stands out, adding a pop of flavor to the beans and spinach. I found that I wanted more tomato sauce (and some water) for thinning out the sauce and enabling it to cover the beans and almond/toasted bread paste. Although there is bread in the mixture, this dish is really nice eaten on/with grilled bread (I rubbed mine with garlic after toasting), or it can be eaten like a hearty stew. 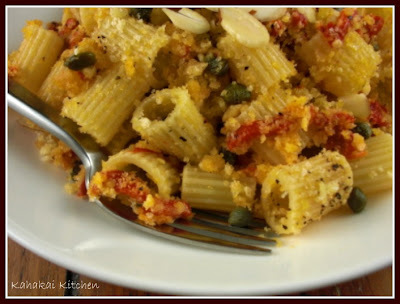 Quick to the table and really delicious, I will be making this again for an easy weeknight meatless meal. 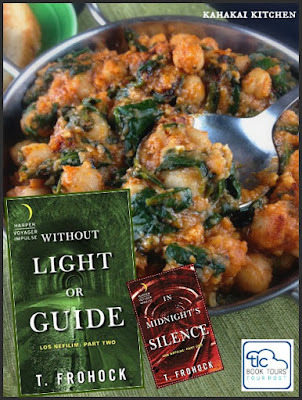 Note: Review copies of "Without Light or Guide" and "In Midnight's Silence" were provided to me by the publisher and TLC Book Tours in return for a fair and honest review. I was not compensated for this review and as always my thoughts and opinions are my own.